Following a season-long celebration of its 25th anniversary in combat sports, CES Boxing begins the first of its next 25 years in February with a major-league doubleheader at Twin River Casino featuring the region’s top prospects. CES Boxing kicks off the 2018 Twin River Casino Fight Series on Friday, Feb. 23rd, 2018at the Event Center with Fall River, Mass., junior middleweight Ray Oliveira Jr. (9-1, 1 KO) headlining for the first time in his career in an eight-round showdown against New Haven, Conn., veteran Edwin Soto (11-2-2, 4 KOs), plus an eight-round co-main event rematch between female welterweights Aleksandra Magdziak Lopes (18-4-3, 1 KO) of Marshfield, Mass., and Natasha Spence (8-3-2, 6 KOs) of Ontario, Canada, who fought to a draw in December. Doors open at 6 p.m. ET with the preliminary card beginning at 7 followed by the main card live on Facebook via FIGHTNIGHT LIVE beginning at 8. FIGHTNIGHT LIVE is available online at www.facebook.com/FaceFIGHTNIGHTLIVE/. The main event features two 27-year-old regional standouts who’ve taken different paths on their inevitable collision course. The son of the legendary “Sucra” Ray Oliveira, who will work his corner again on Feb. 23rd, Oliveira Jr. made his professional debut the day after his 24th birthday with a knockout win over Angel Valdez. Following in the footsteps of his father, a marquee fighter who in his prime headlined a number of events for CES Boxing — including the promotion’s inaugural show in 1992 — Oliveira Jr. finally gets his chance to star in a main event following a narrow win over Connecticut’s David Wilson in his last bout on Sept. 16th. Soto’s been a fixture on the regional circuit for nearly a decade under the tutelage of Luis Rosa Sr., and his wife Marilyn Rosa, who own Boxing In Faith Gym in New Haven. Born in Aguadilla, Puerto Rico, Soto debuted at the age of 19 and spent the next two years campaigning as a junior welterweight under the guidance of CES Boxing, winning six of eight fights. He fought for the first and only time at Twin River in 2010, beating crosstown rival Carlos Hernandez, and makes his 10th appearance with the promotion and first since October of 2013 when he faces Oliveira Jr. next month. Soto’s most notable fights came in late 2013 and early 2014 when he faced unbeaten regional rivals Zach Ramsey and Nick DeLomba before a brief two-year hiatus. 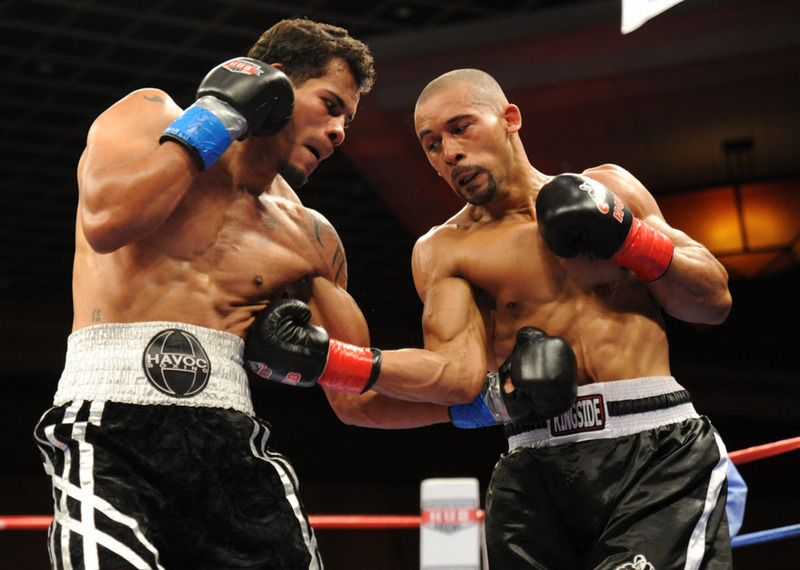 He returned in October with a win over Lawrence, Mass., junior middleweight Anthony Everett. Lopes and Spence are no strangers to the Twin River spotlight. The two fought tooth and nail in December, with Spence winning by two rounds on judge Peter Hary’s scorecard, but Wayne Lima and Eddie Scuncio scored it a draw, setting the stage for next month’s rematch to settle the score. The Feb. 23rd also features the return of longtime fan-favorite “Mr. Providence” Vladine Biosse (15-7-3, 7 KOs), who fights for the first time in a year and a half when he faces Atlantic City, N.J., super middleweight Antowyan Aikens (11-4-1, 1 KO) in a six-round special attraction. Hard-hitting Sicilian heavyweight Juiseppe Cusumano (13-1, 11 KOs) also returns to action in his toughest test to date in a six-round bout against battle-tested Pittsburgh, Pa., native Fred Latham (9-1-2, 5 KOs), while undefeated prospect Jamaine Ortiz (7-0, 4 KOs) of Worcester, Mass., faces Laredo, Tex., veteran Victor Rosas (9-7, 3 KOs) in a six-round lightweight bout. Junior welterweight Anthony Marsella Jr. (7-0, 4 KOs) of Providence returns for his seventh consecutive fight at Twin River dating back to October of 2016 in a separate six-round bout. Regional rivalries highlight the preliminary card, starting with Johnston, R.I., junior welterweight Nicky DeQuattro (2-0, 1 KO) making his Twin River debut in a four-round bout against Carlos Galindo (0-0) of Lima, Peru. Providence lightweight Michael Valentin (3-0, 1 KO) puts his unbeaten record on the line against veteran Luis Rivera (3-3) of Boston and Springfield, Mass., welterweight Miguel Ortiz (2-1, 1 KO) faces pro debut Wilson Mascarenhas of New Bedford, both in four-round bouts. Providence featherweight Ricky Delossantos (3-0) aims for his fourth consecutive win in a four-round bout against New Bedford’s Efren Nunez (0-1).